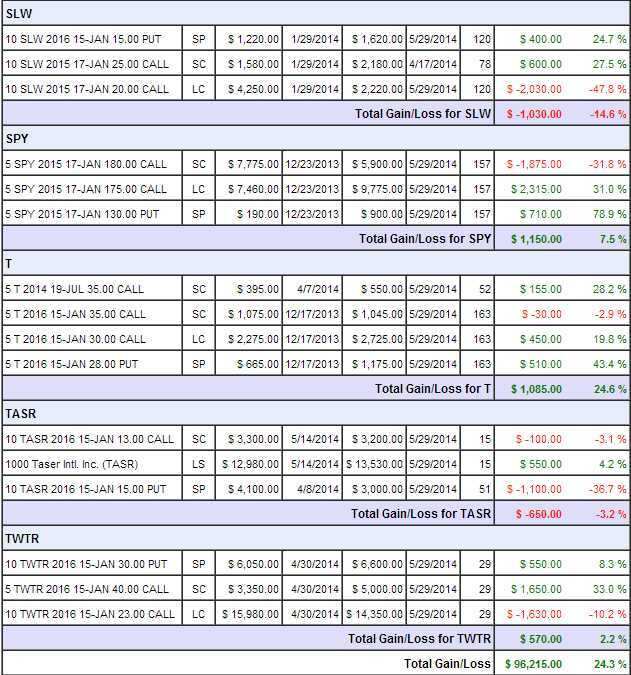 Just two positions remain in our Long-Term Portfolio now, short puts we sold against HOV an EGLE that are "losers," so far. Of our other 29 virtual trades, which we finished closing today, only 3 have a loss, which gives us an 83% winning percentage – which is pretty much in-line with our usual performance for PSW Members (see our Trade Reviews). If you want a quick summary of my reasoning for getting back to cash – it's the same one I had back in March, when we cashed out our Income Portfolio. I was interviewed on TV at the time, where I made my case for caution. Since then, the S&P is up from 1,890 to 1,920 and that rubber band is simply stretched too tightly for our liking now – so we cash out our more aggressive portfolio too. AAPL was our Stock of the Year pick, so that was a no-brainer and we were willing to allocate a much larger than usual block to it. ABX is one that can still work (and we will certainly be going back to this portfolio – in addition to our new Buy List, as we seek to redeploy our cash in the 2nd half of 2014) as are BTU, CLF and EBAY. EGLE is still open and the price is now correct, which is one of the reasons we ended up with more profit than we thought. GLL taught us not to play GLL, the bid/ask spreads were ridiculous. HOV is our other still-open position, IRBT is new but we shut it down anyway (still playable) and LGF, LULU and RIG are still playable as new positions. We didn't shut everything down because we don't like them – we just wanted to be in cash through June 10th and, if the market is still up by then – we'll be happy to get back in. If the market corrects, on the other hand, we will feel like geniuses for protecting our investments so well. The SHLD position had a huge discrepancy because the spreadsheet was picking up the post-split SHLD numbers and not the pre-split options we actually held. It was also a large position and made a pretty big difference in our P&L (to the good side) once we caught the error and fixed it. We are up 19% for the year already, that's worth protecting. If the market keeps going up and up and up, then we will be able to get back in and beat the market, just like we did in the first half, using the same "BE THE HOUSE – Not the Gambler" strategy, as well as our "7 Steps to 40% Annual Returns," which I will be doing as a special Webinar next week. So perhaps we will fall a little bit behind if the market rockets higher but, if the market is flat or down – we'll be well ahead of the game. Just the same way we choose our trades – the potential rewards of being in cash outweigh the risk of being too cautious – so cash it is – for now. Being in cash doesn't take us out of the game. In our May Trade Review, in just the first week, we identified 47 Trade Ideas and called 42 of them correctly. That's a very good percentage (85) since we are purposely picking hedges that can't possibly win if our main trades are winning. I look forward to working with you in the second half of 2014 – we're right on track for that 40% goal! This entry was posted on Thursday, May 29th, 2014 at 5:02 pm and is filed under Appears on main page, Uncategorized, Virtual Portfolio Review. You can leave a response, or trackback from your own site.